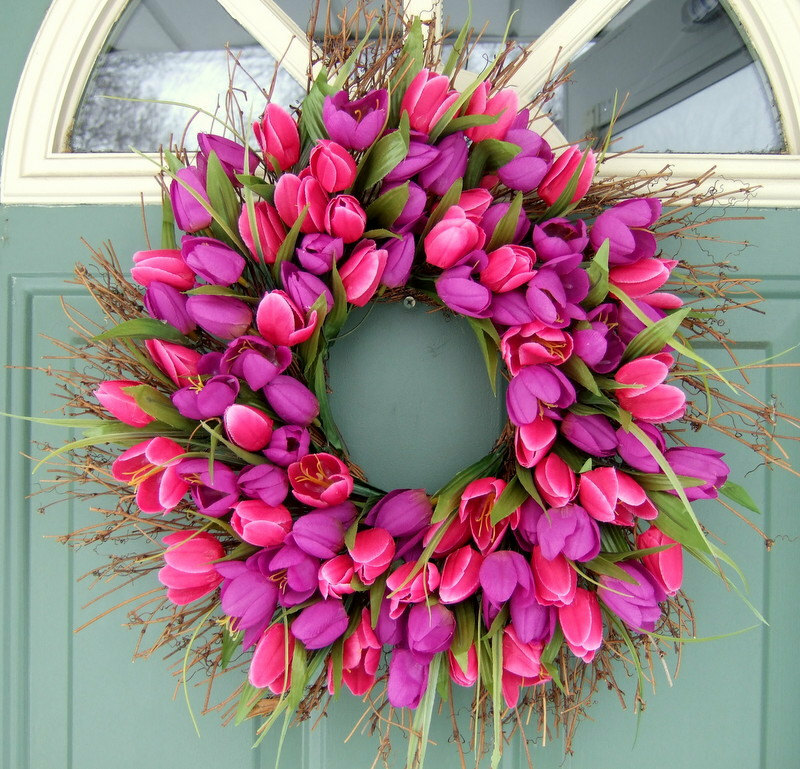 A few posts back I posted this amazing spring inspirational wreath! And ever since it's been on my to-do list, but now I can finally cross it off. I made my copy cat look and of course I'm going to share it with you! To get started you will need your base, I used the 2nd largest size, 5 bouquets of tulips, your scissors and your hot glue. I chose to go with the pink and purple, but Hobby Lobby had a few other colors as well. First pull off all the flower stems and then pull off all the leafs. Cut the stems so they are short and start placing them in between the branches. Mix up your colors and continue this process until the entire wreath is covered up! Some of my flowers were wide and open so I used the hot glue to close them up. Add in leafs as you complete sections of your wreath. Once you have all the flowers attached add in some twisted twigs to add a little more texture. And it's as easy as that! Your wreath is complete! This wreath is beautiful. Thank you for the clear instructions. Happy Spring. Simple and elegant! Thank you for sharing. My mom will love this. Thanks for stopping by! Copy Cat Looks loves all things design and we thrive on fashion, home decor and DIY. We love sharing inspiration and creativity and hope you enjoy what we have to talk about! Be inspired and create! Disclaimer: I do not own the right to all photos. Sources are credited when known. . Powered by Blogger.